Join DiveStrong Canada and our Colleagues Declan Kelly and Lucie Tardif of Hopkins Underwater Adventures diving the beautiful reefs of Belize. Declan is our captain and Lucy is the first mate - together they make this dive adventure 'just like family'. 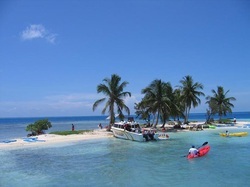 We are diving South Water Caye; Glover's Atoll; Turneffe Islands; The Blue Hole and Lighthouse Reef. All 'don't miss dive sites' in a beautiful tropical environment from a dedicated chartered dive boat. Accommodations are in the newly-built beautiful Beaches and Dreams Boutique Hotel. Awesome all the way around! When to Go: YEAR ROUND! What to Expect: A laid-back attitude and friendly people who want to make your trip exceptional! AND we are diving the "Must Dive" sites - so don't miss out!